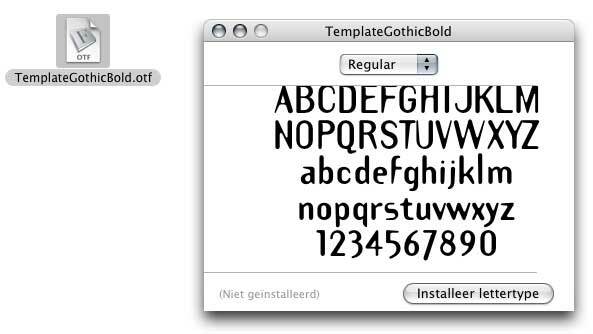 A font that looked fine in pre-OS X Mac systems, looks weird or has no spaces when you install and use it in Mac OS X. Search for installed copies of the font with the Finder’s Search and remove them from all system font folders. Open the font with FontLab 4.5 or higher (or your own favorite font manipulation application). This doesn’t work with all kinds of file formats. Choose from the File menu; Generate Font. From the popupwindow Font Format button, change ‘FontLab’ to ‘OpenType-CFF’ and save the file. By The Way: Do yourself a favor and choose a descriptive name, like TemplateGothicBold instead of temgotbol or something like that and avoid spaces. OS X doesn’t have a problem with spaces, but a lot of others systems, like web servers may. Double-click the new .otf file and install it by clicking the button in the popup window. Double click the .otf file to instal it in OS X.